The term jade is applied to two different types of rock, nephrite and jadeitite, that are made up of different silicate minerals. Nephrite can be found in a variety of green colors and in a creamy white form (known in China as "mutton fat" jade). Jadeitite—which consists almost entirely of jadeite—comes in greater color variations, including dazzling blue, lavender-mauve, pink, and emerald-green. Of the two, jadeitite is rarer, documented in less than 12 places worldwide. During the Stone Age of many cultures, jade was used for axe heads, knives, and other weapons. As metalworking technologies became available, the emphasis shifted toward jade's attractiveness and value in making ornaments and decorative objects. Translucent, emerald-green jadeitite has historically been the most prized variety, and it continues to be regarded as such. As "quetzal" jade, bright green jadeitite from Guatemala was treasured by Mesoamerican cultures; and as "kingfisher" jade, vivid green rocks from Burma became the preferred stone of post-1800 Chinese imperial scholars and rulers. Nephrite jade was used mostly in pre-1800 China as well as in New Zealand, the Pacific Coast and Atlantic Coasts of North America, Neolithic Europe, and Southeast Asia. 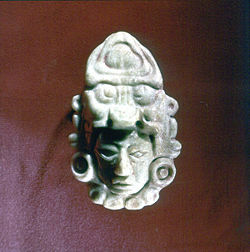 In addition to Mesoamerica, jadeitite was used by Neolithic Japanese and European cultures. The English word jade is derived from the Spanish term piedra de ijada (first recorded in 1565) or "loin stone," from its reputed efficacy in curing ailments of the loins and kidneys. Nephrite is derived from lapis nephriticus, the Latin version of the Spanish piedra de ijada. Both nephrite and jadeitite were used by Stone Age and Bronze Age cultures for similar purposes. They are both about as hard as quartz, exceptionally tough, beautifully colored, and can be delicately shaped. Thus for a long time they were thought to be the same type of rock. It was not until the nineteenth century that a French mineralogist determined that "jade" was in fact two different materials. Nephrite jade consists of the calcium- and magnesium-rich amphibole mineral actinolite. 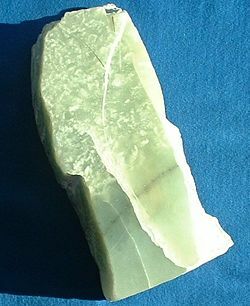 Jadeitite consists almost entirely of jadeite, a sodium- and aluminum-rich pyroxene. Jade has a Mohs hardness of between 6.5 and 7.0, so it can be worked with quartz or garnet sand and polished with bamboo or even ground jade. Burma (Myanmar) and Guatemala are the principal sources of modern gem jadeitite, and Canada is the main source of modern lapidary nephrite. Jade is the official gemstone of British Columbia, where it is found in large deposits in the Lillooet and Cassiar regions. During the Neolithic era, the key known sources of nephrite jade in China for utilitarian and ceremonial jade items were the now-depleted deposits in the Ningshao area in the Yangtze River Delta (Liangzhu culture, 3400–2250 B.C.E.) and in an area of the Liaoning province in Inner Mongolia (Hongshan culture 4700–2200 B.C.E.). Jade was used to create many utilitarian and ceremonial objects, ranging from indoor decorative items to jade burial suits. It was considered the "imperial gem." From about the earliest Chinese dynasties until present, the jade deposits in most use were from the region of Khotan in the Western Chinese province of Xinjiang. There, white and greenish nephrite jade is found in small quarries and as pebbles and boulders in the rivers flowing from the Kuen-Lun mountain range northward into the Takla-Makan Desert area. River jade collection was concentrated in the Yarkand, the White Jade (Yurungkash) River and Black Jade (Karakash) River. From the Kingdom of Khotan, on the southern leg of the Silk Road, yearly tribute payments consisting of the most precious white jade were made to the Chinese Imperial court and there transformed into objets d'art by skilled artisans, as jade was considered more valuable than gold or silver. Jadeitite—with its bright emerald-green, pink, lavender, orange, and brown colors—was imported from Burma to China only after about 1800. The vivid green variety became known as Feicui (翡翠) or Kingfisher (feathers) Jade. It quickly replaced nephrite as the imperial variety of jade. The use of jade and other greenstone was a long-term tradition in Korea (c. 850 B.C.E. – 668 C.E.). The craft production of small comma-shaped and tubular 'jades' using materials such as jade, microcline, jasper, etc. in southern Korea originates from the Middle Mumun Pottery Period (c. 850-550 B.C.E. ), when such ornaments appeared in burials and pit-house floors (Bale and Ko 2006). Comma-shaped jades are found on some of the gold crowns of Silla royalty (c. 300/400-668 C.E.) and sumptuous elite burials of the Korean Three Kingdoms. After the state of Silla united the Korean Peninsula in 668 C.E., the widespread popularization of death rituals related to Buddhism meant that the use of jade in burials as prestige mortuary goods quickly disappeared. Nephrite jade in New Zealand, known as pounamu in the Māori language, is highly valued and plays an important role in Māori culture. It is considered a taonga, or treasure, and therefore protected under the Treaty of Waitangi. Its exploitation is restricted and closely monitored. The South Island of New Zealand is Te Wai Pounamu in Māori—"The [land of] Greenstone Water"—because that is where it was found. This jade was used to make weapons and ornaments, particularly the mere (short club), and the Hei-tiki (neck pendant). These were believed to have their own mana, handed down as valuable heirlooms, and often given as gifts to seal important agreements. With no metal tools, it was also used for a range of tools, such as adzes. In New Zealand English, the common term for this jade is "greenstone." Jewelry made from it in Māori designs is widely popular with locals and tourists. Much of the jade itself is now imported from British Columbia and elsewhere. All the jadeite in Mesoamerica, used by the Olmec, Maya, and all other cultures since about 3000 B.C.E., comes from the Motagua river valley in Guatemala, and it was one of the most valuable objects in those cultures. A bead of jade was worth two loads of gold, for instance. The Spaniards, however, were thirsty for gold and did not appreciate it. Consequently, the mining stopped and the sources were forgotten until the 1940s, when they were rediscovered. Currently, Guatemala produces some of the most appreciated jadeite stones in the world, with soft colors that include translucent lilac, blue, green, and yellow, as well as the most creamy and brilliant black in the world. It is also the source of the widest variety of new colors, such as Rainbow Jade and the unique Galactic Gold—a black jadeite with natural incrustations of gold, silver, and platinum. Jadeite: Agate verdâtre, Feitsui, Jadeit, Jadeita, Natronjadeit, Yunnan Jade, Yu-stone, Sinkiang jade. Nephrite: Aotea, Axe-stone, B.C. Jade, Beilstein, Grave Jade, Kidney Stone, Lapis Nephriticus, Nephrit, Nephrita, Nephrite (of Werner), New Zealand Greenstone, New Zealand Jade, Spinach Jade, Talcum Nephriticus, Tomb Jade. Many minerals are sold as jade. They include serpentine (also bowenite), carnelian, aventurine quartz, glass, grossularite, Vesuvianite, soapstone (and other steatites such as shoushan stone), and recently, Australian chrysoprase. "Korean jade," "Suzhou jade," "Styrian jade," "Canadian jade," "olive jade" and "new jade" are all really serpentine; "Transvaal jade" is grossularite. In almost all dictionaries, the Chinese character 'yù' (玉) is translated into English as "jade." However, this frequently leads to misunderstanding: Chinese, Koreans, and Westerners alike generally fail to appreciate that the cultural concept of "jade" is considerably broader in China and Korea than in the West. A more accurate translation for this character on its own would be "precious/ornamental rock." It is seldom, if ever, used on its own to denote 'true' jade in Mandarin Chinese. For example, one would normally refer to ying yu (硬玉, “hard jade”) for jadeite, or ruan yu (軟玉, “soft jade”) for nephrite. The Chinese names for many ornamental non-jade rocks also incorporate the character 'yù,' and it is widely understood by native speakers that such stones are not, in fact, true precious nephrite or jadeite. Even so, for commercial reasons, the names of such stones may still be translated into English as "jade," and this practice continues to confuse the unwary. Type A jadeite has not been treated in any way except surface waxing. This type of jadeite, carat by carat, is the most expensive gem in the world, even more so than diamond. Type B treatment involves exposing a promising but stained piece of jadeite to chemical bleaches and/or acids and impregnating it with a clear polymer resin. This results in significant improvement of transparency and color of the material. Currently, infrared spectroscopy is the only technique to test for the presence of polymer in jadeite. Type C jade has been artificially stained or dyed. The red color of red jade can be enhanced with heat. The effects are somewhat uncontrollable and may result in a dull brown. In any case, translucency is usually lost. Type A treatment is the only form of enhancement acceptable to professional collectors. ↑ Elizabeth Kennedy Easby, Pre-Columbian Jade from Costa Rica (New York: André Emmerich, 1968). ↑ Aggregates of actinolite also make up one form of asbestos. ↑ Mohs Gemstone Hardness Scale Orions Gemz and Jewelry. Retrieved August 8, 2007. Bale, Martin T. and Min-jung Ko. 2006. “Craft Production and Social Change in Mumun Pottery Period Korea.” Asian Perspectives 45(2): 159-187. Laufer, Berthold. 1912. Jade: A Study in Chinese Archeology & Religion. Reprinted 1974. New York: Dover Publications. This page was last modified on 14 March 2018, at 20:28.